CUTE 3 B.R. RANCH ON PAVEMENT LOCATED NORTH OF M-59 AND DOWNTOWN HOWELL. 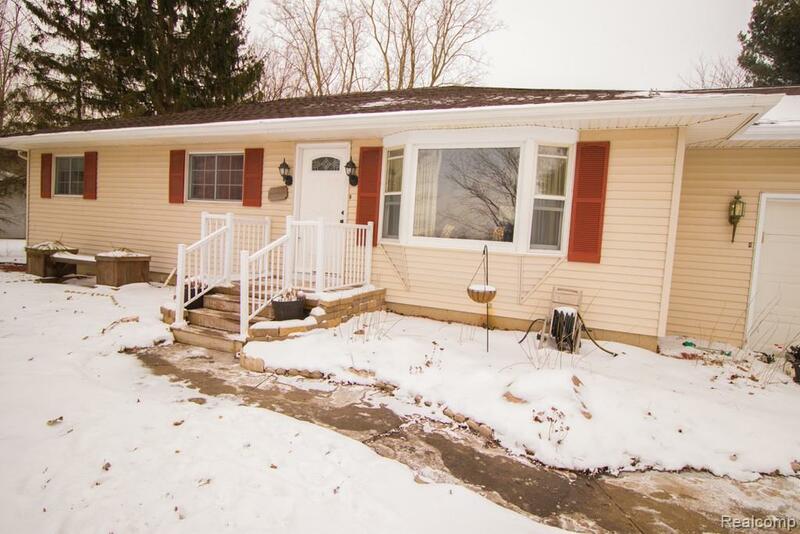 THIS RANCH FEATURES NICE SIZE LIVING ROOM THAT IS NEWLY CARPETED (wood underneath) WITH A LARGE BAY WINDOW FOR PLENTY OF SUNLIGHT, GALLEY KITCHEN WITH LOTS OF CABINET SPACE, TILE FLOORING AND A DINING AREA. BEDROOMS ARE ADEQUATELY SIZED AND HAVE NATURAL WOOD FLOORING. DOORWALL TO NEWER ('17) TREX DECKING. PERFECT FOR FAMILY BARBECUING, ENTERTAINING OR ENJOYING YOUR MORNING COFFEE. BASEMENT IS PARTIALLY FINISHED WITH WOOD COVERING, NEW BLOCK WINDOWS AND A NEW EGRESS AND INGRESS WINDOW. NICE 1/2 ACRE WITH TREES AND ALSO 2 SHEDS. THERE ARE LOTS OF UPDATES:ROOF IN '05, FURNACE AND A/C IN '03, EGRESS WINDOW IN '14, WATER TANK '16, FRONT PORCH AND ENTRY '17, FRONT AND SIDE DOORS '15. GREAT LOT TO BUILD YOUR OWN POLE BARN TOO! (BACK FENCE IS PROPERTY LINE) CLOSE TO TOWN, SHOPPING, AND HOSPITAL. HOWELL SCHOOLS. COME SEE! !